You guys. Today, my friend Danae from Recipe Runner is sharing some of her favorite waffles. And I won’t lie, I kind of wish we were neighbors so she could come over here and share a batch with me! They are insane! I’ll be making up a big batch soon and so should you! Check them out! Hi everyone! I’m Danae the recipe creator, photographer, blogger, and crazy runner over at Recipe Runner. I was so excited when Kim invited me to share a waffle recipe for Waffle Week! In case you haven’t figured it out, the girl is a waffle FANATIC! Not only is this whole week dedicated to waffles, but she even has an awesome Waffle Week 2014 Pinterest board! Being a runner I look forward to a big carb loaded breakfast after my long runs on the weekend and waffles are one of my favorite treats. 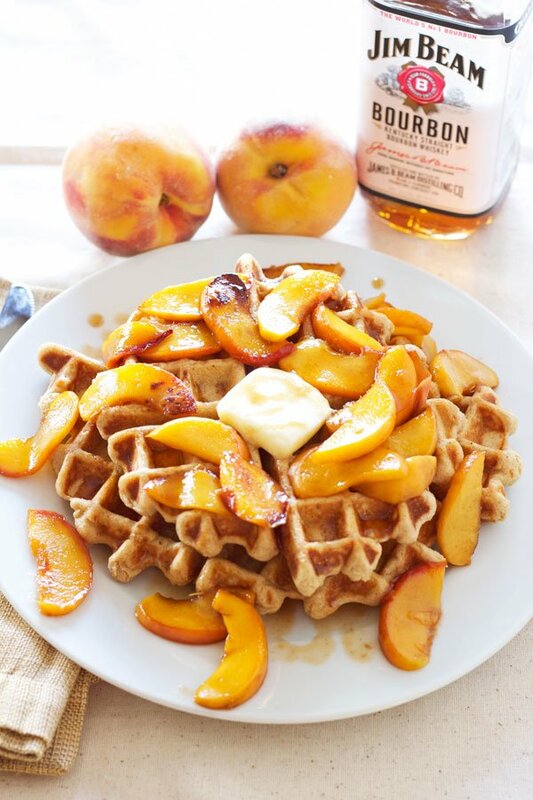 Today I’m sharing my recipe for Whole Wheat Waffles with Bourbon Peaches. Yeah you read that right, there’s bourbon, now you know they’re gonna be good! Living in Colorado we get some amazing local peaches during the late summer and I have been taking full advantage of them, using them in everything I possibly can. The peaches are grown on the western slopes of Colorado and they are sweeter, juicier, and far better tasting than any peaches I’ve ever had. 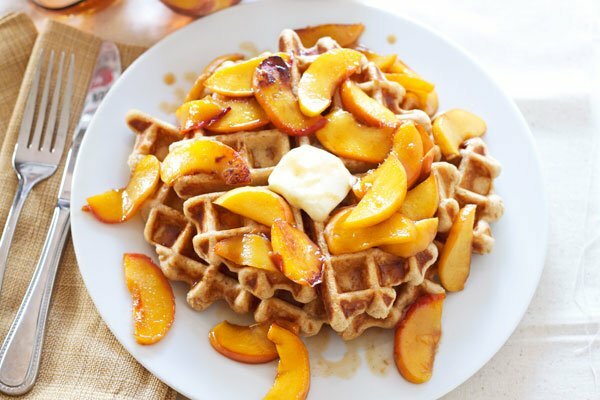 Since the peaches are still going strong here, I knew I wanted to share a waffle recipe where the sweet, juicy Palisade peaches would be the star. To make the bourbon peach topping for these hearty and healthy whole wheat waffles I started by thinly slicing two peaches. No need to peel them, I don’t have the patience, but if you really want to be my guest. I then melted a teaspoon of butter in a small sauté pan and threw in the sliced peaches. I let the peaches cook over medium high heat for about a minute and then it was time to add in the good stuff! To the peaches, I added a few tablespoons of bourbon, a couple tablespoons of brown sugar, and a touch of vanilla. The smell of butter, bourbon, and peaches immediately filled the kitchen and it was all I could do not to just eat all of the topping with a spoon! After another couple minutes of cooking, I removed the peaches from the burner and let them cool slightly while I made the waffles. The waffles are 100% whole wheat which not only makes them filling and nutritious, but also gives them a nice nutty flavor that I enjoy. We all know that to get the crispness that you love and expect in a waffle you need some butter. Well, anyone can melt butter and add it to waffles, but if you want a real punch of flavor you BROWN that butter! I’m a firm believer that brown butter makes everything better. If you’ve never tried it you absolutely must! Along with the delicious nutty flavors of the whole wheat and brown butter, I also added cinnamon and a little almond extract. Once the waffles were perfectly brown and crisp, I immediately topped them with the bourbon peaches. It was all I could do not to inhale them before taking pictures to share with you (I may or may not have snuck some of the peaches while I was photographing). So before the last of the summer peaches are gone and replaced by gorgeous orange pumpkins, make these super delish Whole Wheat Waffles with Bourbon Peaches! In a saute pan melt the butter over medium high heat. Add in the sliced peaches and saute for a minute. Add in the bourbon, brown sugar, and vanilla. Saute another 2 minutes or until the peaches have caramelized slightly and the sauce has thickened. In a small saucepan over medium heat melt the butter. Continue to heat the melted butter until it starts to foam, this is good. Stir the foamy butter until the foam subsides and starts to brown. Once the butter is a caramel color remove it from the heat and pour it in a small dish to cool. In a mixing bowl whisk together the whole wheat flour, salt, cinnamon, sugar, and baking soda. In another bowl whisk together the buttermilk, egg yolk (save the egg white in another bowl), cooled brown butter, and almond extract. Add the wet ingredients into the dry and fold together until combined. Using a stand mixer, hand mixer, or a whisk, whisk the egg white until stiff peaks form, about 2-4 minutes. Gently fold the egg white into the waffle batter being careful not to deflate it. Using a 1/2 cup measuring cup, scoop out the batter and add it to a heated and greased waffle iron. Cook the waffle until golden brown and crispy. 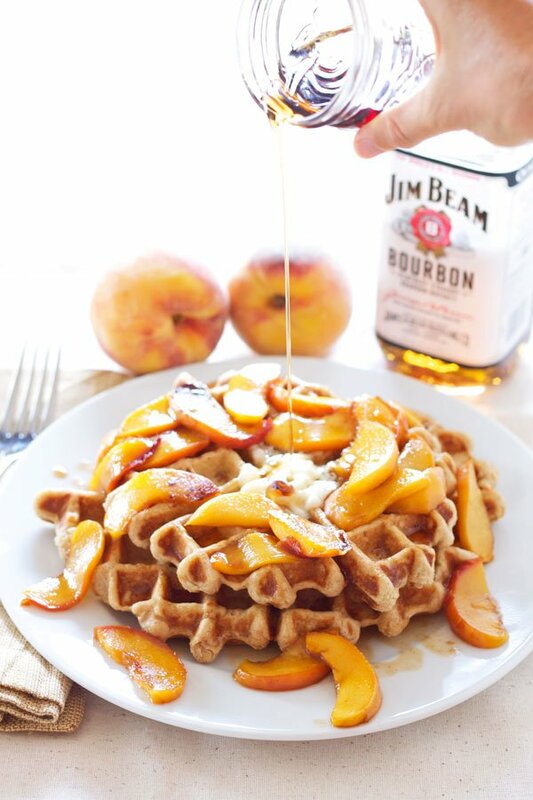 Spoon the bourbon peaches over the waffle and top with butter and maple syrup if desired. The waffle recipe was adapted from The Complete America's Test Kitchen TV Show Cookbook. Hands down the most gorgeous waffle I’ve ever seen! Oh wow, these are absolutely gorgeous…and absolutely mouthwatering. 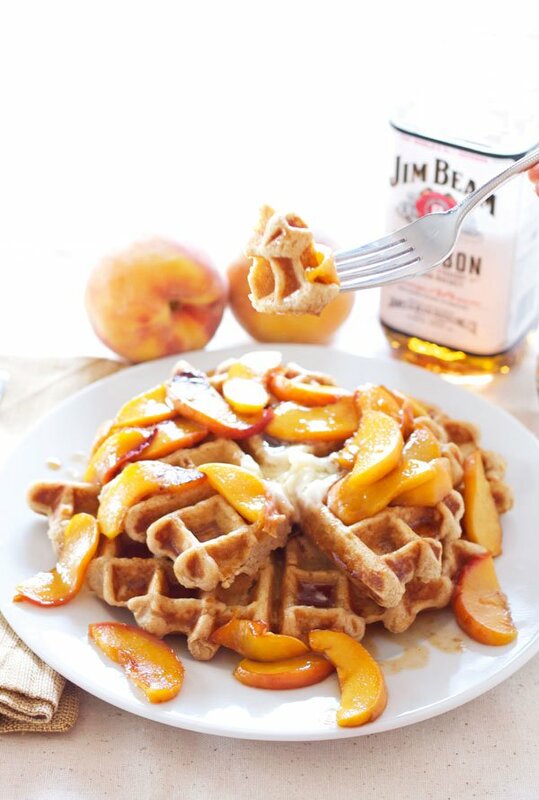 Peaches and bourbon are already a match made in heaven, but poured over waffles? Stroke of brilliance. A fabulous breakfast with those peaches and sauce! I refuse to give up on peaches yet. Love these waffles! I want that entire plate…. asap. The most perfect breakfast EVER! What a great mixture. You have a very good imagination! Yum! I love to bake with WW pastry flour…really perfect in these waffles! A wonderful recipe to contribute to waffle week, Danae! A bourbon peach topping??? Holy moly that sounds delicious! These waffles! Those peaches! Now this is my kind of breakfast. delicious! I have a bunch of peaches in my kitchen right now, and I’m pretty sure I’ll be making waffles this weekend now. Wow! This looks delicious!! A little bit of booze for breakfast… now we’re talking! You had me at bourbon peaches. It makes me so happy to see peaches. Love me some summer fruit on top of waffles….yum!